 Africa is a Continent, that is a very big piece of Land, surrounded by an Ocean. Almost like an Island, only very much bigger. On a Continent there are usually a number of different Countries. 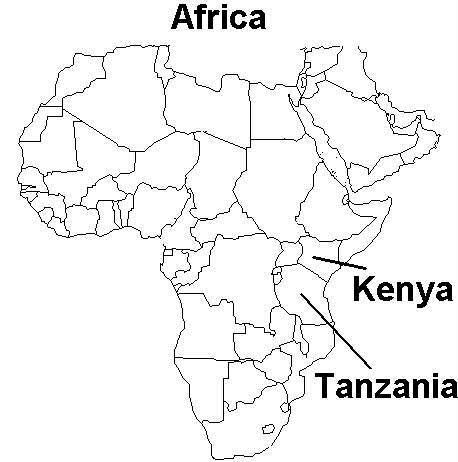 Kenya and Tanzania are only two of the many Countries on the Continent of Africa. Both Countries are located in that part of Africa that is called East Africa and the Ocean there is the Indian Ocean. Africa is a very special Continent on Earth. Only here can you find large areas of Land, where the wild animals can still live like they have done for millions of years. And another thing is different in Africa. When we have Summer in Germany then it is Winter in Africa and when in Germany is Winter in Africa is Summer. Summer and Winter are not that different from each other in Africa. It is almost always warm, be it in the Summer or in Winter. Also the days in Africa are always of the same length. Not like in Germany, where the Sun rises late and sets early in Winter. The day in Africa always begins at about six in the morning and the ends in the evening about seven o’clock, when the sun sets. Kenya is a very fertile Country. A lot of the fruits that we can buy in the supermarket come from here. For example Pineapples, Mangoes, Oranges and of course Coconuts. Every year a lot of People from Germany and other Countries travel to Kenya to spend a Holiday there. They want swim in the Ocean and of course the want to see the many wild animals, that in Germany you can only see in the Zoo. The People of Kenya are always very friendly. If you visit someone you will be offered the very best in food and drink. Even if the people do not have a lot of money. There will only be the best for the guests. Also it is a custom to give the visitors presents, because to treat a guest badly will bring bad luck to the whole of the family. Very often the whole family must work for a week or more, to be able to pay for food, drink and the presents for the guests. Kenya is also the place on Earth where live seems to have begun. 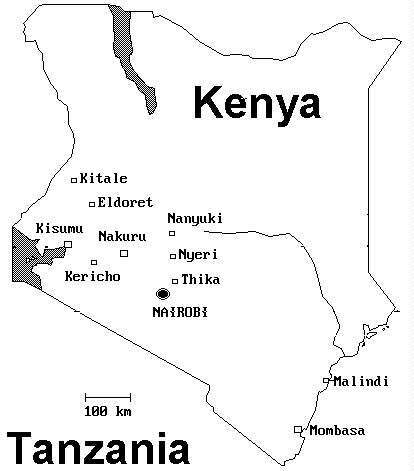 The first human beings lived in Kenya. They looked more like the monkeys today, but from these mankind evolved. One of the scientists investigating this is our friend Richard Leakey. There are a number of places in Kenya, where one can visit those early homes of the People. Usually there is a Museum there, where you can see Bones of man and animal, as well as the tools these people used. 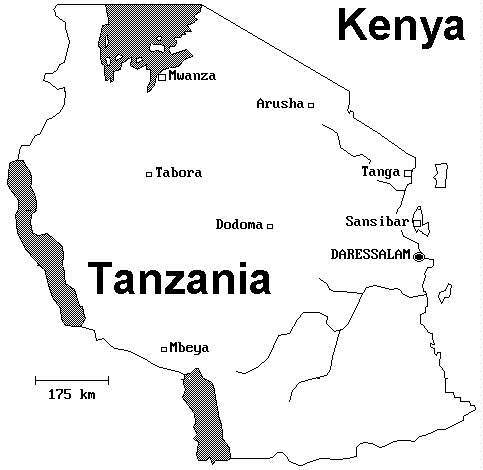 Tanzania used to be called Tanganyika or German-East Africa. But that was a long time ago, when Germany still had an Emperor. Tanzania too is a very fertile Country, where almost everything grows. But it is also a very poor Country. Only very few people possess all of those things that we take for granted. Running Water, Electricity or Electric lighting you will search for in vain in most homes. If you are ill you usually have to walk over long distances to get to the nearest Hospital or to a Doctor. It is then the whole family that takes the patient to the Hospital, because they do not give you food there. The family has to supply food and drink to the ill and do the cooking. The Hospitals do not have enough money to pay for the food. It does not cost much to go to the Doctor. Usually the people pay only as much as they can afford. Those that have more money have to pay more and those who are poorer, have to pay less. Most of the people in Tanzania live in rural areas, earning a living as Farmers. They have their fields where they grow Maize, Beans and Sugar cane or they plant Bananas or Pineapples that they can sell at the local markets. In Germany you can only buy one type of Banana, but in Tanzania and Kenya, you can find as many as forty different kinds on the market. They all look and taste different. Some of them are yellow like the ones we buy, others are red, green or even blue. They all taste delicious.